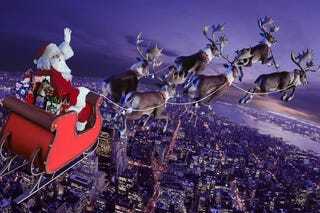 Never mind the existence of a surveillance system that can determine if you have been naughty and nice, the big question is how does that fat guy get round all those chimneys in a single night? I don’t think it is available as a poster anymore, but the folks at Science Gallery put together a handy infographic that highlights key requirements for Santa’s flight. They don’t factor in any Elf Service or reindeer with radiant nasal capacity, but there are useful facts like the availability of a 36 hour schedule.